A 6th century skeleton showing fused vertebrae, a sign of severe ankylosing spondylitis. The cause of ankylosing spondylitis is unknown; however, it is believed to involve a combination of genetic and environmental factors. The underlying mechanism is believed to be autoimmune or autoinflammatory. Diagnosis is typically based on the symptoms with support from medical imaging and blood tests. AS is a type of seronegative spondyloarthropathy, meaning that tests show no presence of rheumatoid factor (RF) antibodies. There is no cure for ankylosing spondylitis. Treatments can improve symptoms and prevent worsening. This may include medication, exercise, and surgery. Medications used include NSAIDs, steroids, DMARDs such as sulfasalazine, and biologic agents such as infliximab. Between 0.1% and 1.8% of people are affected. Onset is typically in young adults. Males are more often affected than females. The condition was first fully described in the late 1600s by Bernard Connor; however, skeletons with ankylosing spondylitis are found in Egyptian mummies. 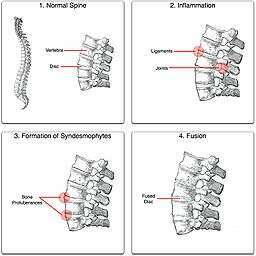 The word is from Greek ankylos meaning stiffening, spondylos meaning vertebra, and -itis meaning inflammation. As the disease progresses, loss of spinal mobility and chest expansion, with a limitation of anterior flexion, lateral flexion, and extension of the lumbar spine, are seen. Pain is often severe at rest but improves with physical activity. However, many experience inflammation and pain to varying degrees regardless of rest and movement. When the condition presents before the age of 18, it is more likely to cause pain and swelling of large lower limb joints, such as the knees. In prepubescent cases, pain and swelling may also manifest in the ankles and feet where heel pain and enthesopathy commonly develop. Less commonly ectasia of the sacral nerve root sheaths may occur. "Bamboo spine" develops when the outer fibers of the fibrous ring (anulus fibrosus disci intervertebralis) of the intervertebral discs ossify, which results in the formation of marginal syndesmophytes between adjoining vertebrae. 34-year old male with AS. Inflammatory lesions of the anterior chest wall are shown (curved arrows). 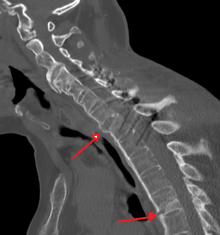 Inflammatory changes are seen in the lower thoracic spine and L1 (arrows). There is no direct test to diagnose AS. The Schober's test is a useful clinical measure of flexion of the lumbar spine performed during the physical examination. Magnetic resonance imaging (MRI), and X-ray studies of the spine, which show characteristic spinal changes and inflammation of the sacroiliac joint, combined with a genetic marker blood test are the major diagnostic tools. Juvenile anyklosing spondylitis (JAS) is a rare form of the disease which differs from the more common adult form. Enthesophathy and arthritis of large joints of the lower extremities is more common than the characteristic early-morning backpain seen in adult AS. Ankylosing tarsitis of the ankle is a common feature, as is the more classical findings of seronegative ANA and RF as well as precense of the HLA-B27 allele. Primary engagement of the appendicular joints may explain delayed diagnosis, however other common symptoms of AS such as uveitis, diarrhoea, pulmonary disease and heart valve disease may lead suspicion away from other juvenile spondyloarthropathies. The hunched position that often results from complete spinal fusion can have an effect on a person’s gait. Increased spinal kyphosis will lead to a forward and downward shift in center of mass (COM). This shift in COM has been shown to be compensated by increased knee flexion and ankle plantarflexion. The gait of someone with ankylosing spondylitis often has a cautious pattern because they have decreased ability to absorb shock, and they cannot see the horizon. This daguerreotyp from 1857 shows a severe case of AS. Ankylosing spondylitis has a long history, having been distinguished from rheumatoid arthritis by Galen as early as the 2nd century AD. Skeletal evidence of the disease (ossification of joints and entheses primarily of the axial skeleton, known as "bamboo spine") was found in an archaeological dig that unearthed the skeletal remains of a 5000-year-old Egyptian mummy with evidence of bamboo spine. It was not until the late nineteenth century, however, when the neurophysiologist Vladimir Bekhterev of Russia in 1893, Adolph Strümpell of Germany in 1897, and Pierre Marie of France in 1898 were the first to give adequate descriptions which permitted an accurate diagnosis of AS prior to severe spinal deformity. For this reason, AS is also known as Bekhterev Disease, Bechterew's Disease or Marie–Strümpell Disease. ↑ Matteson, E. L.; Woywodt, A. (2006-11-01). "Eponymophilia in rheumatology". Rheumatology. 45 (11): 1328–1330. doi:10.1093/rheumatology/kel259. ISSN 1462-0324. PMID 16920748. 1 2 3 4 5 6 7 8 "Questions and Answers about Ankylosing Spondylitis". NIAMS. June 2016. Retrieved 28 September 2016. ↑ "Ankylosing spondylitis". GARD. 9 February 2015. Retrieved 28 September 2016. ↑ Smith, JA (January 2015). "Update on ankylosing spondylitis: current concepts in pathogenesis.". Current allergy and asthma reports. 15 (1): 489. PMID 25447326. ↑ Khan, Muhammad Asim (2009). Ankylosing Spondylitis. Oxford University Press. p. 15. ISBN 9780195368079. ↑ Boos, Norbert; Aebi, Max (2008). Spinal Disorders: Fundamentals of Diagnosis and Treatment. Springer Science & Business Media. p. 25. ISBN 9783540690917. 1 2 3 4 5 6 7 8 "Ankylosing Spondylitis -Professional reference for Doctors - Patient UK". Patient UK. Retrieved 26 May 2014. ↑ Longo, Dan Louis; Fauci, Anthony S.; Harrison, Tinsley Randolph; Kasper, Dennis L.; Hauser, Stephen L.; Jameson, J. Larry; Loscalzo, Joseph (2012). Harrison's Principles of Internal Medicine. Vol. 1 (18th ed.). McGraw-Hill. ISBN 978-0-07-163244-7. 1 2 3 4 5 6 Adrovic, Amra; Barut, Kenan; Sahin, Sezgin; Kasapcopur, Ozgur (2016-08-01). "Juvenile Spondyloarthropathies". Current Rheumatology Reports. 18 (8): 55. doi:10.1007/s11926-016-0603-y. ISSN 1534-6307. PMID 27402112. ↑ "Ankylosing Spondylitis -Professional reference for Doctors - Patient UK". Patient UK. Retrieved 22 December 2013. ↑ Thomas E, Silman AJ, Papageorgiou AC, Macfarlane GJ, Croft PR (1998). "Association between measures of spinal mobility and low back pain. An analysis of new attenders in primary care". Spine. 23 (2): 343–7. doi:10.1097/00007632-199802010-00011. PMID 9507623. ↑ Garrett S, Jenkinson T, Kennedy LG, Whitelock H, Gaisford P, Calin A (1994). "A new approach to defining disease status in ankylosing spondylitis: the Bath Ankylosing Spondylitis Disease Activity Index". J Rheumatol. 21 (12): 2286–91. PMID 7699630. ↑ Calin A, Garrett S, Whitelock H, Kennedy LG, O'Hea J, Mallorie P, Jenkinson T (1994). "A new approach to defining functional ability in ankylosing spondylitis: the development of the Bath Ankylosing Spondylitis Functional Index". J Rheumatol. 21 (12): 2281–5. PMID 7699629. ↑ Kroon F, Landewé R, Dougados M, van der Heijde D (October 2012). "Continuous NSAID use reverts the effects of inflammation on radiographic progression in patients with ankylosing spondylitis". Ann. Rheum. Dis. 71 (10): 1623–9. doi:10.1136/annrheumdis-2012-201370. PMID 22532639. ↑ Chen J, Lin S, Liu C (27 November 2014). "Sulfasalazine for ankylosing spondylitis.". The Cochrane database of systematic reviews. 11: CD004800. doi:10.1002/14651858.CD004800.pub3. PMID 25427435. ↑ Chen J, Veras MM, Liu C, Lin J (28 February 2013). "Methotrexate for ankylosing spondylitis.". The Cochrane database of systematic reviews. 2: CD004524. doi:10.1002/14651858.CD004524.pub4. PMID 23450553. ↑ Braun J, van den Berg R, Baraliakos X, Boehm H, Burgos-Vargas R, Collantes-Estevez E, Dagfinrud H, Dijkmans B, Dougados M, Emery P, Geher P, Hammoudeh M, Inman RD, Jongkees M, Khan MA, Kiltz U, Kvien T, Leirisalo-Repo M, Maksymowych WP, Olivieri I, Pavelka K, Sieper J, Stanislawska-Biernat E, Wendling D, Ozgocmen S, van Drogen C, van Royen B, van der Heijde D (June 2011). "2010 update of the ASAS/EULAR recommendations for the management of ankylosing spondylitis". Ann. Rheum. Dis. 70 (6): 896–904. doi:10.1136/ard.2011.151027. PMC 3086052 . PMID 21540199. ↑ Maxwell, LJ; Zochling, J; Boonen, A; Singh, JA; Veras, MM; Tanjong Ghogomu, E; Benkhalti Jandu, M; Tugwell, P; Wells, GA (18 April 2015). "TNF-alpha inhibitors for ankylosing spondylitis.". The Cochrane database of systematic reviews. 4: CD005468. doi:10.1002/14651858.CD005468.pub2. PMID 25887212. ↑ Braun J, Sieper J (2007). "Ankylosing spondylitis". Lancet. 369 (9570): 1379–90. doi:10.1016/S0140-6736(07)60635-7. PMID 17448825. ↑ Brulhart L, Nissen MJ, Chevallier P, Gabay C (February 2010). "Mixed response to tocilizumab for ankylosing spondylitis". Annals of the Rheumatic Diseases. 69 (12): 2217–2218. doi:10.1136/ard.2009.126706. PMID 20525837. ↑ Rodríguez-Escalera C, Fernández-Nebro A (2008). "The use of rituximab to treat a patient with ankylosing spondylitis and hepatitis B". Rheumatology. 47 (11): 1732–1733. doi:10.1093/rheumatology/ken362. PMID 18786966. ↑ "Philadelphia Panel evidence-based clinical practice guidelines on selected rehabilitation interventions: overview and methodology". Phys Ther. 81 (10): 1629–40. 2001. PMID 11589641. ↑ Dagfinrud H, Kvien TK, Hagen KB (23 January 2008). "Physiotherapy interventions for ankylosing spondylitis.". The Cochrane database of systematic reviews (1): CD002822. doi:10.1002/14651858.CD002822.pub3. PMID 18254008. ↑ Sieper J, Braun J, Rudwaleit M, Boonen A, Zink A (2002). 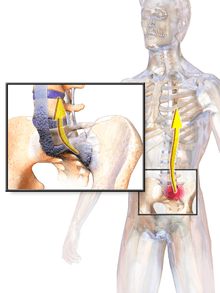 "Ankylosing spondylitis: an overview". Ann. Rheum. Dis. 61 Suppl 3: iii8–18. doi:10.1136/ard.61.suppl_3.iii8. PMC 1766729 . PMID 12381506. ↑ Bond D (2013). 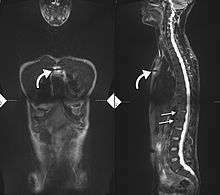 "Ankylosing spondylitis: diagnosis and management". Nurs Stand. 28 (16-18): 52–9; quiz 60. doi:10.7748/ns2013.12.28.16.52.e7807. PMID 24345154. 1 2 Briot K, Roux C (2015). "Inflammation, bone loss and fracture risk in spondyloarthritis". RMD Open. 1 (1): e000052. doi:10.1136/rmdopen-2015-000052. PMC 4613172 . PMID 26509065. 1 2 Alpert, Joseph S. (2006). The AHA Clinical Cardiac Consult. Lippincott Williams & Wilkins. ISBN 0-7817-6490-4. ↑ Ahn NU, Ahn UM, Nallamshetty L, Springer BD, Buchowski JM, Funches L, Garrett ES, Kostuik JP, Kebaish KM, Sponseller PD (2001). "Cauda Equina Syndrome in AS (The CES-AS Syndrome): Meta-analysis of outcomes after medical and surgical treatments". Journal of Spinal Disorders. 14 (5): 427–433. doi:10.1097/00002517-200110000-00009. PMID 11586143. 1 2 Bakland G, Gran JT, Nossent JC (November 2011). "Increased mortality in ankylosing spondylitis is related to disease activity". Ann. Rheum. Dis. 70 (11): 1921–5. doi:10.1136/ard.2011.151191. PMID 21784726. ↑ "Ankylosing Spondylitis Linked to Cardiovascular Mortality". Medscape. Retrieved 7 October 2015. ↑ Braun, J; Pincus, T (2002). "Mortality, course of disease and prognosis of patients with ankylosing spondylitis.". Clinical and experimental rheumatology. 20 (6 Suppl 28): S16–22. PMID 12463441. ↑ Radford EP, Doll R, Smith PG (September 1977). "Mortality among patients with ankylosing spondylitis not given X-ray therapy". N. Engl. J. Med. 297 (11): 572–6. doi:10.1056/NEJM197709152971103. PMID 887115. ↑ Del Din S, Carraro E, Sawacha Z, Guiotto A, Bonaldo L, Masiero S, Cobelli C (2011). "Impaired gait in ankylosing spondylitis". Med Biol Eng Comput. 49 (7): 801–9. doi:10.1007/s11517-010-0731-x. PMID 21229328. ↑ Goldman, Lee (2011). Goldman's Cecil Medicine (24th ed.). Philadelphia: Elsevier Saunders. p. 607. ISBN 1-4377-2788-3. ↑ Brionez TF, Reveille JD (July 2008). "The contribution of genes outside the major histocompatibility complex to susceptibility to ankylosing spondylitis". Curr Opin Rheumatol. 20 (4): 384–91. doi:10.1097/BOR.0b013e32830460fe. PMID 18525349. ↑ Dieppe P (1988). "Did Galen describe rheumatoid arthritis?". Annals of the Rheumatic Diseases. 47 (1): 84–87. doi:10.1136/ard.47.1.84-b. PMC 1003452 . PMID 3278697. ↑ Calin A (April 1985). "Ankylosing spondylitis". Clin Rheum Dis. 11 (1): 41–60. PMID 3158467. ↑ Benoist M (April 1995). "Pierre Marie. Pioneer investigator in ankylosing spondylitis". Spine. 20 (7): 849–52. doi:10.1097/00007632-199504000-00022. PMID 7701402. ↑ Blumberg BS (December 1958). "Bernard Connor's dcription of the pathology of ankylosing spondylitis". Arthritis Rheum. 1 (6): 553–63. doi:10.1002/art.1780010609. PMID 13607268. ↑ Leden I (1994). "Did Bechterew describe the disease which is named after him? A question raised due to the centennial of his primary report". Scand J Rheumatol. 23 (1): 42–5. doi:10.3109/03009749409102134. PMID 8108667. ↑ Bechterew W (1893). "Steifigkeit der Wirbelsaule und ihre Verkrummung als besondere Erkrankungsform". Neurol Centralbl. 12: 426–434. ↑ Strumpell A (1897). "Bemerkung uber die chronische ankylosirende Entzundung der Wirbelsaule und der Huftgelenke". Dtsch Z Nervenheilkd. 11 (3–4): 338–342. doi:10.1007/BF01674127. ↑ Marie P (1898). "Sur la spondylose rhizomelique". Rev Med. 18: 285–315.